I come from a multiethnic family – with a strong influence by my Indian paternal grandmother, as she is the matriarch of our large and boisterous family. This influence shows itself a LOT through our food preferences – dad to this day can’t go 3 days without having dhal (the special dhal recipe Nini passed down to all of us, not just any old random dhal you can get at a Mamak store in Malaysia), and my absolute favourite food in the whole wide world is tandoori chicken. With all the trimmings. So when it comes to cooking, as much as I love cooking western food, the most common type of Asian food I would cook is Indian food – not only is it familiar and therefore easy, it’s also damned delicious! 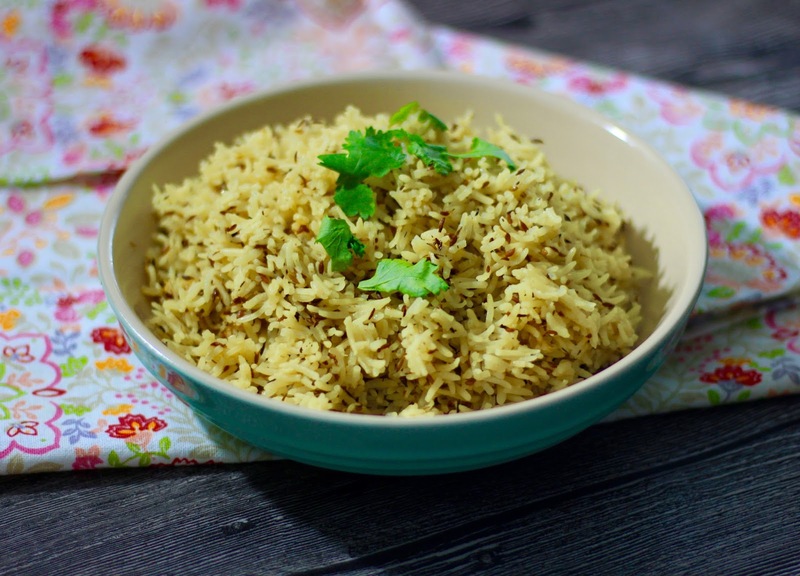 I’m about to share a series of different Indian food recipes (as Nini makes them) in the next few posts, but I’ll start with the easiest and most basic of all – rice. There are many types of rice that you can cook, but this is my favourite as it also uses the best spice in the world – Cumin. Heat a tbsp of coconut oil (or vegetable oil, doesn’t have to be fancy) in a saucepan and add all the spices once hot. Toast the spices for about 3 – 4 minutes. Add the rice and stir to mix with all the spices, and continue to toast for about 2 – 3 minutes – I don’t know why, it may have something to do with how the flavours mix together. Add the water and pinch of salt, cover and keep on a low heat for 15 minutes. At the 15 minute mark, remove the lid, turn off the heat and fluff up the rice with a fork. You can keep the lid on to retain heat or serve immediately with a garnish of chopped cilantro and your favourite curries. Easy no? I also do this with quinoa when I’m feeling extra guilty. The trick to using quinoa is to ensure you wash it thoroughly before cooking and also to toast it (step 2) for slightly longer (4 – 5 mins) until you hear a soft popping sound and a nutty smell arises. Then add the water and cook for 15 minutes too. Next Post Tomatoes, mozzarella and toast! First time mum to a beautiful baby boy, working full time in the financial industry who dreams of writing a cookbook of favourite family recipes one day.